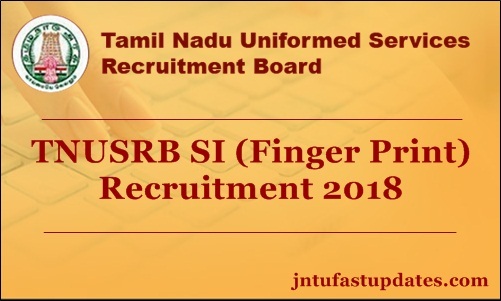 TNUSRB SI Finger Print Recruitment 2018: Tamil Nadu Uniformed Services Recruitment Board has invited Applications For Men, Women and Transgender candidates, only through online mode for direct recruitment to the 202 post of Sub-Inspector of Police (Finger Print). Tamil Nadu Uniformed Services Recruitment Board is constituted by the Tamil Nadu Government. This Board is conducting competitive examinations for the posts of Gr.II Police Constables, Gr.II Jail Warders, Firemen, Sub-Inspectors of Police, Sub-Inspectors of Police (Technical) and Sub-Inspectors of Police (Finger Print) and selecting the eligible candidates for these posts. SCALE OF PAY: 36900 – 116600. The payment options are online and offline through State Bank of India. i. When “CASH” mode is chosen for payment by the candidate, then the other online modes like Net banking, Credit card / Debit card and UPI are restricted to the candidate for payment. ii. On choosing the “CASH” mode of payment, the challan is generated and the details of the challan will be sent to the candidate’s e-mail id also. iii. The challan generated through SBI e-pay portal “CASH” mode is valid for 6 days as per the date mentioned in the challan. iv. The Challan payment can be made at any of the SBI bank branches only during the bank transaction hours. The transaction hours may vary from branch to branch. v. If the payment is not made through the generated challan within the valid period (6 calendar days from generation), then the application of the candidate becomes invalid. The candidate has to register again with new e-mail ID and Mobile number to fill a new application for the post. i. If the candidate choose any of the Online payment modes like Net banking or Credit card or Debit card or UPI and if there is any interruption or disconnection in making payment or if the payment gets cancelled due to unknown reasons if any, then the candidate is allowed to make payment only after 30 minutes. ii. If the payment is successful, then the status of the payment will be reflected in the candidate’s dashboard within 24 hours. iii. If the candidate is not able to pay through any of the Debit / Credit card he /she can go for cash / Net banking mode of payment. iv. The candidates are advised to submit the application and make payment well in advance before the last date of notification to avoid last minute congestion and failures.